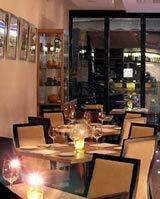 Vino Rosso in Devonshire Road is the latest addition to the clutch of Chiswick Italian restaurants. At the upmarket end (£22.50 for two courses from antipasti, pasta and mains; £29.50 for three, and desserts extra), it is still finding its feet, but our visit showed that it is capable of more than competent cooking. We turned up without a booking on a Saturday evening and got a table, though all but two tables were taken by the time we left. Service was friendly, but a little chaotic: we had no delays, but other tables did, and there were signs of panic in the background. These are probably early-days wobbles: we were there only some ten days after it opened. Complimentary bellinis appeared, with good meaty olives. Our starters were decidedly good – my wife’s sfogliatina a piece of light puff pastry on spinach and porcini, and my potato gnocchi small, also light and with a mixture of crumbled Italian sausage and porcini sparingly sauced that worked well. My main – deep fried courgette flowers stuffed with scamorza (smoked mozzarella) and tomatoes – was also excellent, the flowers in a thin crisp batter, served on a not too obtrusive sweet and sour sauce, with very thinly sliced courgttes. My wife’s calves liver was less successful – cooked pink as she had ordered, but in rather too thick slices, with fried polenta and figs. Not positively bad, but not up to the rest of the meal, which was decidedly good. As it should be: we missed out on desserts (priced £6.50 to £6.95; cheese a rather steep £9.50), but with a bottle of generic Sicilian nero’d’avola at £18, one coffee (a somewhat greedy £3), a bottle of water and service, the bill came to £78.19. So at the upper end of pricing, but with indications of real ability in the cooking. If they can settle down and make the whole operation a bit less frenetic, with all dishes up to the standard of the best, Vino Rosso could be quite an asset for a bit of a special, rather than a bog standard, night out.